a.) Press 'NEXT' on the welcome screen. b.) When asked choose the directory in which you want to install the lobby. By clicking on 'NEXT' you accept the current destination folder. c.) Then select a name for the program folder that will appear in the programs section of your start menu, there you will find the lobby software later on. 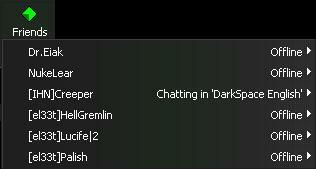 *Note - Downloading the Full Darkspace Installation will automatically include the GameCQ Chat Lobby upon installation. To create a new account, simply enter the neccessary information and a valid email address, and click OK to continue. This will create your username, and log you into the GameCQ Chat Lobby. From this image map, you can see the interface is divided up into 7 sections. Here is an explanation of each. 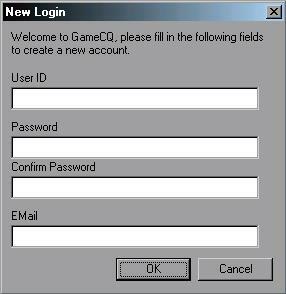 Like any other porgram, the Main Menu of the GameCQ Chat Client controls many functions of the program itself. Here we have 5 menu options. Save Chat: Currently Unavailable, this feature will allow you to record a chat log. 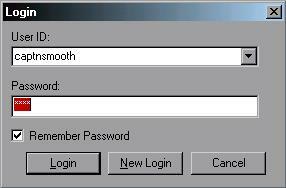 Change Password: Allows you to change your password. You will have to relog before any changes take effect. Change Name: Allows you to select a different username. You will have to relog before any changes will take effect. Change Email: Changes the email address you wish to display. Exit: Closes the GameCQ Chat Client. Undo: Undoes the last command. Cut: Cuts the selection and saves it to the clipboard. Copy: Copies the selection and saves it to the clipboard. Paste: Pastes the last saved selection from the clipboard. Broadcast: Sends a message to all online players. *Note: This function is only available to moderators and administrators. Caption Bar: This can be found directly below the GameCQ Menu, which displays your name, your current status, and online time. Navigation Bar: This is found at the right of the GameCQ Menu, and controls the navigation of the Main Display, just like many browsers would. Chat Bar: This is the Chat Input at the bottom of the screen. Game Bar: This is the left side of the GameCQ Menu. Status Bar: The Status Bar is found at the bottom of the interface. Options: This will dispaly an options menu, where you can change you Game Refresh Interval, Chat Buffer, Chat Sound, Room Announce, Language, and Emotes. Ignores: Displays all the players you are currently ignoring, and gives you the option to remove them from your ignore list. Displays help information for the GameCQ Chat Client. About GCQL: Gives version information about the GameCQ Chat Client. Manual Online: Brings you to the fabulous online manual! This refers to the Servers list, which will be refreshed for whatever time you enter in this area. This allows you to choose how much chat is displayed in the Chat Screen area. The bigger the buffer, the more chat line will be displayed. When a new message appears in the Chat Screen, a sound will be displayed indicating a new message has been recieved. This option will enable / disable chat sound. When entering a room, you have the option of having the GameCQ Chat Client automatically announce your arrival, or not. Simply change this option. 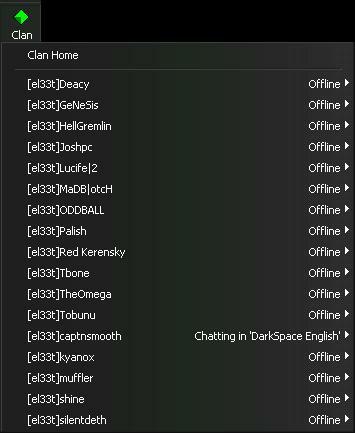 When you enter the GameCQ Chat Lobby, you will automatically be placed into a defaul chat room, usually the Darkspace English room. If you change your language setting, then you will be place in the Darkspace <language here> room upon login. a.) Click Add. This will bring up a prompt, asking for the emote name, and input text. b.) Enter a name you wish to call the emote. c.) Enter the input text. You will want to start with /me if you want it to display as an emote. Also, use $d to display the player name you have selected the emote for. To edit an existing emote, simply double click on the emote, and change it to what you would like. To remove an emote, just click Remove and choose the emotes you wish to delete. Clicking on Default will reset your emotes to the original list that came with the GameCQ Chat Client. After you are finished, click OK to save all changes, or Cancel to return without saving your changes. This menu consists of 2 sections: the Navigation Options (found on the left) and the Game Options (found on the right). The Navigation Options are similar to the ones found on many internet browsers, and will move you back, forward, and refresh pages that you've seen in the Main Display. The Game Options section consists of several buttons, each with its own function. Clicking the Lobby button will bring up two options: Darkspace or GameCQ. Selecting "Darkspace" will display the Darkspace homepage in the Main Display. Selecting "GameCQ" will display the Palestar homepage. Clicking the Servers button will bring up a list of servers in the Main Display. Clicking the Download button will bring up a list of downloadable files in the Main Display. Clicking the Home button will bring you back to the Darkspace homepage. Clicking on the Rooms button will display a list of rooms that are available for you to join. 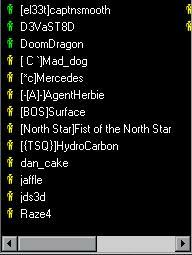 This includes all official Darkspace chat rooms, as well as user created rooms. It will also display the number of members currently in a room. Clicking the New Room button will allow you to create your own room. This will prompt you to select a name for you room, and will automatically place you in that room once you have created it. See the prompt to the left. Clicking the Friends button will bring up a list of friends that you have added to your friends list. It will display each friend and their current status. If you click on a name, it will give you the option to send that player a message, or delete that player from your friends list. Read the GameCQ Chat Client Commands on how to add friends. Clicking on the Clan button will display a list, depending on your status as a clan member. Clan Members: That is, you are currently in a clan. The Clan button will then display a list of all your clan members, as well as their current status. Here, the only option is to send them a message. Selecting the Clan Home option will bring you to your clan page on Darkspace, displayed in the Main View. Non Clan Members: That is, you are not currently in a clan. The Clan button will then display only the Clan Home selection, which will bring you to the Darkspace list of clans, sorted by faction. Profile Clicking the Profile button will display your current profile in the Main View. 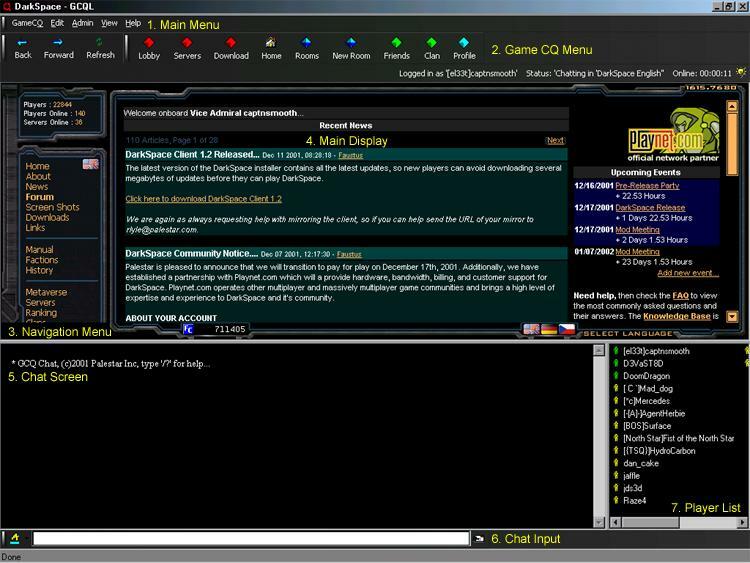 Once you enter the GameCQ Chat Client, the Darkspace homepage will take up most of the mid part of the interface. The homepage can be easily navigated through by using the Navigation Menu to the left. Clicking on these links will display pages in the Main View, to the right. This is where most of the navigation will be displayed when you are browsing through the Darkspace homepage as well as viewing the Server List, the Download Page, and the Profile Page. Above is the default display you should get, the Darkspace homepage. You can also change the language that you view the Darkspace homepage in. Simply click a flag at the "Select Language" area, and you will be brought to that languages homepage. Currently, there are German and Czech mirrors. The Server List will display all the servers that are currently running on Darkspace. They are sorted by Name, Description, Lag, and Number of Players. To sort by any one of these catagories, simply click the tab you wish to sort by. Check out n00bpsace - Servers for more information on server listings. The Download Page will give you many options. From here, you can download the Darkspace Client, screenshots, sounds / music, and other goodies. You can also upload files, such as screenshots and map editor files. However, all files must be approved by the Palestar team before they will be added to the Download Page. The Profile Page will display all of your statistics, as well as badges you have earned throughout the way. 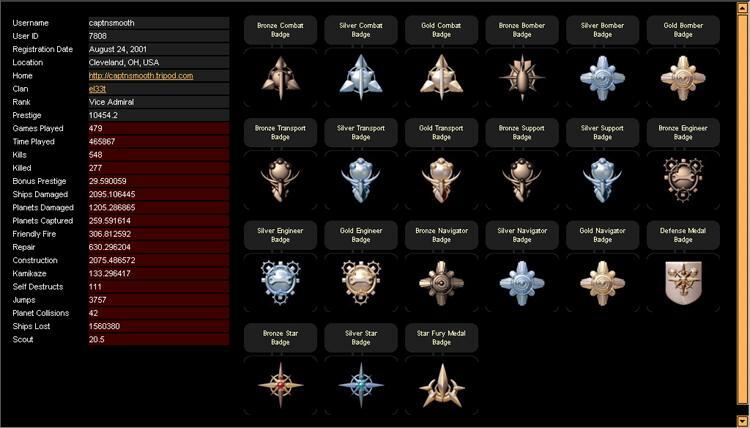 Check out n00bspace for more information on prestige, ranks, and badges. How Do I read the Profile Page? The Profile Page is quite easy to read. To the right, you will see all your statistics, organized by certain catagories. We'll get into that in a minute. The main part of the Profile Page is take up by a display of badges (if you have any). Badges are acquired when you have reached a certain number of points in certain catagories. Combined with rank, these will give you access to bigger and better ships. Back the the statistics. They are divided up into several catagories. The first catagories, displayed in black, are your basic information. It will display your registration date, your ID number (used by administrators and moderators), user information, prestige, and rank. The catagories displayed in red are your game statistics. This ranges from time played, to repair points, to planet collisions. For a more detailed look at these catagories, check out n00bspace - prestige guide. If you are having trouble with these commands, just type in a command, for instince /friend, and it will prompt you and tell you what else you need to input to correctly use a certain command. This is where you type you text that you wish to send to the lobby. *Note: HTML coding can be used in the lobby, so you can manipulate you font size, type, color, etc if you know the proper HTML codes. You can also change the color of your text. At the bottom of the screen, you should see a space where you enter your text to chat. To the left, there is a small letter "A" with a color bar under it. The color bar indicated the current color of your text. To change it, click next to the "A" to the right. This brings up a color selection. Just pick and choose, and you're done! 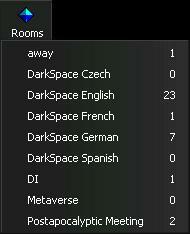 This is the list of players currently in the Darkspace chat room. You will notice all the players have a little "person" next to their names. For normal players, the color of this "person" will be yellow. Moderators will have a green person next to their names, and for Administrators the color will be white. Moderators are players who have volunteered to help administrators enforce the rules. Administrators are the creators of the game Darkspace or the Community Managers.